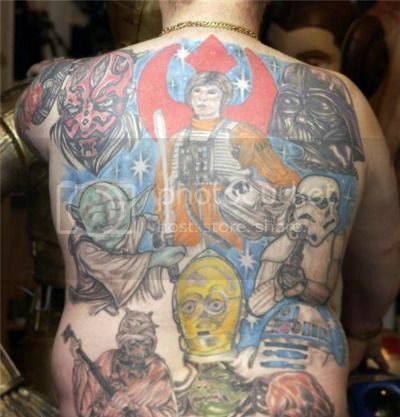 Ok, so this Star Wars tattoo isn’t a complete mess. I mean, Luke Skywalker looks distinctly more like Dorothy Hamill than Mark Hamill, but otherwise… um, lovely. Ish. Via Ugliest Tattoos, whose efforts at source attribution aren’t so much sloppy as they are nonexistent. I knew that version of Yoda looked familiar. Way to put your finger on it.